NOTE: We will have copies of this page available at the conference, but if you want a color copy, you will have to print this map at your own facilities. Mediterranean folks please note: Most restaurants typically CLOSE their kitchens at 22:00! Kostis' comment: Edible food and nice place to sit outdoors if the weather is good. Other than that, nothing special on the menu. Kostis' comment: An above average restaurant offering some nice pasta dishes and a deer specialty. Richard's comment: Specialty: very good (and large) pizzas, semi-deep-pan style. Kostis' comment: Pretty decent Greek food (for Sweden, that is). Only indoors sitting. Richard's comment: Fine Italian restaurant. Kostis' comment: Nice decor, decent and tasty food, but probably an insult to restaurants in Italy to describe it as "fine" Italian restaurant... Recommended nevertheless. Kostis' comment: Offers the best selection of wines you can find anywhere in Uppsala. Beware, the prices per glass are ridiculous. Prices for dishes are OK though. Kostis' comment: Traditional and tasty Swedish cuisine. Recommended if you want Swedish food and the weather allows sitting outside. Kostis' comment: A typical grill place. Tables are next to the river offering a nice view. A bit on the expensive side considering its quality. Unless you really want grilled stuff or you want to sit outside, restaurant #2, which belongs to the same owner, is probably a better choice. Kostis' comment: This is a Greek restaurant located in very nice, old, impressive premises (must see actually!). The food served is OK but nothing special. Food-wise, there are better alternatives; premise-wise, none. Kostis' comment: A very classy Swedish restaurant. Traditional Swedish dishes served here in a nice environment. Probably the most expensive restaurant on this list. Recommended, if you can afford it. Kostis' comment: The best fish restaurant in Uppsala (and among the best in Sweden!). A bit on the expensive side. The place to go if you want to eat fish or seafood. Kostis' comment: I consider it the best restaurant in Uppsala! (It is considered among the best in Sweden.) Very nice and tasty Swedish cuisine. A bit expensive but not ridiculously so and probably worth it. Kostis' comment: The Greek restaurant in Uppsala with the least kitsch-y decor. Considering that it is located in Sweden and not in Greece, the food is quite decent. Recommended for those that like "Greek food". Kostis' comment: Atlantis is the restaurant of Radisson Hotel. Nouvelle cuisine is mostly served here (in proper portions, though). A bit on the expensive side but recommended. East West is a Swedish/Uppsala version of TGI Fridays. Also recommended. Kostis' comment: No comment - I've never eaten here! Jesper's comment: How did this end up in the list? Richard's comment: Nice pub food and good beer. Fish 'n chips recommended. Kostis' comment: The place in Uppsala with the biggest beer and whisky selection. Other than that, a typical Irish pub. You know what you should expect. Richard's comment: Good pasta and pizza restaurant. Kostis' comment: Cheap (and quite OK) pasta and pizza restaurant. Kostis' comment: See my comment on restaurant #17. Kostis' comment: Nice hip environment. Decent food. OK prices. Recommended. Kostis' comment: Despite its name, it is mostly a bar. As such, it offers bar food (burgers, fajitas and such). Richard's comment: Quite good thai food. Service may be slow. Richard's comment: China River is a quite decent chinese restaurant. Specialty: szechuan and indonesian. China Garden have a decent buffet. Richard's comment: The best chinese restaurant in town (according to some). Also has a separate sushi bar nextdoor. Kostis' comment: The Greek restaurant in Uppsala with the most kitsch-y interior decor. If the weather is good and you can sit outside, go there: the "Greek dishes" are edible and the menu includes nice, inexpensive pizzas. Otherwise don't. Kostis' comment: Yet another Greek restaurant with a less kitsch-y decor. Same recommendation as above, except that you will not find pizzas on the menu. Kostis' comment: Same as above, but the interior decoration is Swedish kitsch-y; not Greek kitsch-y. Typical Swedish menu with Swedish prices. Cafés (Red numbers) NOTE: Most cafés typically close at 18:00. Richard's comment: A classic since 1887. Richard's comment: Famous for their huge cinnamon buns (but not for much else). Richard's comment: Makes you feel like the old geezer that you are. Richard's comment: Nice place with an ecological profile. Richard's comment: Old-style swedish café. Good cakes/pastries and light food. Richard's comment: Making very nice cakes and pastries by royal appointment. Richard's comment: Specialty: home made ice cream. Richard's comment: Nice café by the bird pond. Richard's comment: Nice bar, often with live music. Food ok, but small servings. 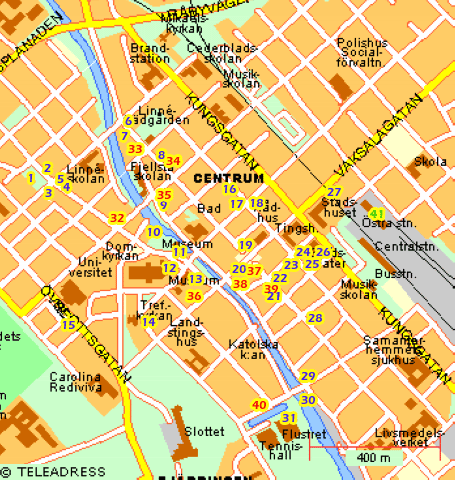 Nope, Uppsala does not have only one bar. Many restaurants also serve as bars. From the list above 1, 2, 3, 6, 10, 16, 19, 20, 23, 24, and 31. Enjoy! Most places have menus in English, and those that do not, have waiters that speak English. Only Swedish currency is accepted. However, most restaurants accept credit cards (VISA & MasterCard). You do NOT have to leave a tip (it is included in the prices, which also include taxes). Some sort of small rounding (e.g. bill of 187 SEK ==> leave 190 SEK or 200 if very satisfied) is recommended.